The five brothers, Groucho (Julius, 1890-1977), Chico (Leonard, 1887-1961), Harpo (Adolph, 1888-1964), Gummo (Milton, 1893-1977), and Zeppo (Herbert, 1901-1979) Marx were real-life brothers born in New York City. As the Marx Brothers they enjoyed success on the vaudeville circuit. When Gummo was drafted to serve during World War I, the remaining four brothers continued to perform on Broadway and in motion pictures. They grew in popularity throughout the 1930s and starred in many films, including Animal Crackers (1930), Monkey Business (1931), A Day at the Races (1937), A Night in Casablanca (1946), and Love Happy (1949). 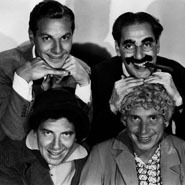 The American Film Institute selected five of the Marx Brothers' 13 feature films as being among the top hundred comedy films.